My stay at Happy Go Lucky was pretty good. The receptionist is not the most pleasant but he was helpful when I asked questions. The rooms are warm and the linens were clean and comfortable. The bunk beds are quite old and make a lot of creaking noise. The bathrooms are clean but the showers are highly inconvenient as they have no doors, no place to keep your toiletries and they are turned on by a sensor. The wifi isn't reliable either as it is slow and requires regular reconnection. Fairly good hostel for the price. Beds were very old but the location is perfect there is a train station just 30 seconds away from the hostel and a supermarket just around the corner. Staff was okay a little rude during check in but other than that it was great . 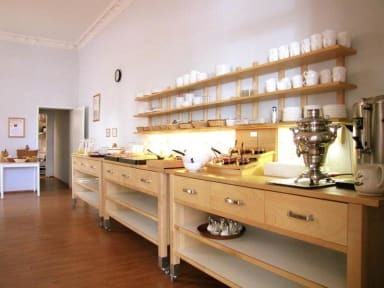 Location: Next to a S bahn, it can be reach but it is far from the center (we are talking about from 30 min up to 50 min). Staff members working there they do their job and that's it. Don't expect a high energy chatty person. The rooms are good in general, beds are ok, but most beds squeek when you move, this can get annoying. Each dorm has a locker (bring your lock), the towel provided was a face towel (quite small). No microwave or appliances in hostel to use. Stores are not far away. The bed is too noise, when someone move , the bed must like noise pollution. And unstable . Make you can’t sleep . We have spent 4 nights with my girlfriend at a 6 bed room, because my parent paid a visit to Berlin and we let them our home for their stay. The location itself it's not the very best if you are on a holiday, it is rather far from most of the clubs. The staff wasn't the most welcoming, but no particular incident has happened between us. The inner decoration and the atmosphere of the whole hostel is quite disappointing compared to our previous hostel experiences. The cleanliness was ok.
We have been traveling for a long time now and this is by far the worst hostel we have stayed in. I have no idea why the employees work there, the only nice person works nights. The others will never greet you with more than a glance. 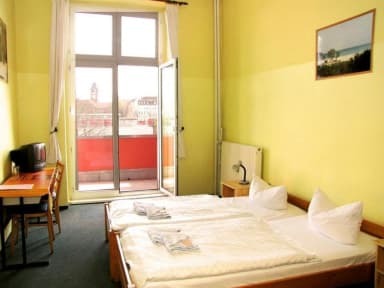 We decided to leave Berlin two days early because of this hostel. The bathrooms are ok. The rooms have key card entry, but there isn’t anywhere to store your stuff in the rooms. Generally everything is off in this hostel, the people, the staff, the rooms, the vibe.